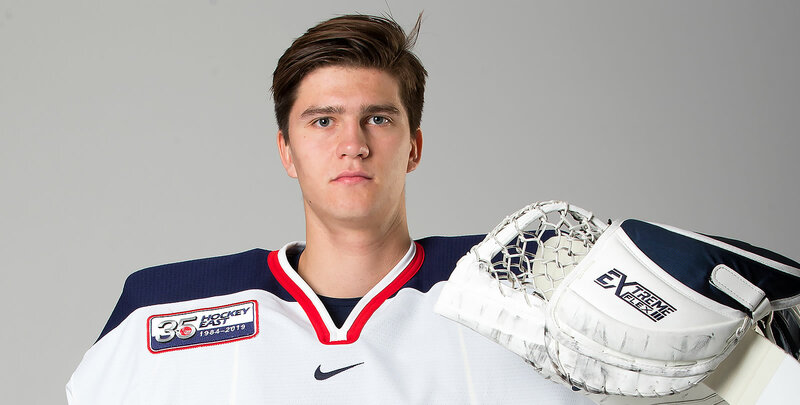 HARTFORD, Conn. - UConn freshman Jonny Evans (North Delta, British Columbia) scored twice and assisted on two more while fellow rookie Tomas Vomacka (Trutnov, Czech Republic) stopped 29 shots to record his first career shutout as the Huskies posted 5-0 win over visiting Merrimack Saturday night at the XL Center. The Huskies notch their second-straight win to improve to 9-17-2 overall and 4-12-2 in Hockey East. The Warriors fall to 7-20-1 overall and 4-14-0 in league play. The win came in front of 8,211 fans at XL Center, the biggest crowd for a UConn hockey game at the downtown Hartford arena. In addition to Evan's four point night, fellow freshman Ruslan Iskhakov (Moscow, Russia) scored a goal and added an assist to match his career-high for points. Junior Benjamin Freeman (Falmouth, Maine) added a goal and an assist and sophomore Zac Robbins (Glenview, Ill.) scored his first of the season in the win. UConn notched their first shutout at home since a 4-0 win over Alabama Huntsville back on October 8, 2016. Vomacka stopped seven in the first, 15 in the second and sealed it with seven saves in the third for his fourth win on the season. UConn put 18 shots on Merrimack's Halladay in the first period and put the game's first goal on the board just 1:05 into play. Evans picked-up the puke behind the net and found Iskhakov in front. The rookie patiently held the puck until he could pull the goaltender out of position, then tucked it inside the right post for his fifth on the season and a 1-0 lead. The UConn offense erupted in the second and put three on the board to take full control of the game. The Huskies put three on the board in the span of 4:09 starting with Robbins first on the season at 10:16. Robbins caught the defense sleeping and slid into the slot where he one-time a feed from Freeman into the lower right corner to make it 2-0. The Huskies got a power play right off the goal and Freeman delivered just 34 seconds after the Robbins goal. Iskhakov fed Freeman in the slot and he buried a one-timer as well for his fifth on the year and a 3-0 lead. Evans completed the trifecta with his first of the night coming at 14:25, taking a pass from Max Kalter into the zone and sneaking one top-shelf past Halladay from the left circle, his fourth of the season. Evans closed out the scoring with a pretty give-and-go with Iskhakov at the 5:00 minute mark of the third. Evans dished to Iskhakov in the left circle and went to the front of the net. Iskhakov threaded a sweet pass back to Evans who buried the feed for his second of the night and a 5-0 lead. The Huskies will be back in action with a home-and-home series with Boston University on the schedule. The Huskies will open the series at home on Friday night at the XL Center.